We can supply and ship to you 220V powered air filtration system, air purifiers, air cleaners made by Quatro Air Technologies (made in North America- Canada, not the cheap, mass-produced, made with plastic, air filtration, air cleaner, air purifying system). Yes, even to the Philippines (Via Johnny Air Cargo) or your choice of carrier. 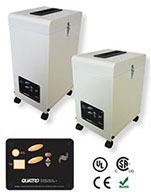 Dust and Odor Air Filtration System, Air Cleaner, Air Purifier for your home, office, and business. Available in 220V, overseas voltage.